John Hyde, riding JR, pulls Will Faust over a jump in Steamboat Skijoring’s inaugural race. 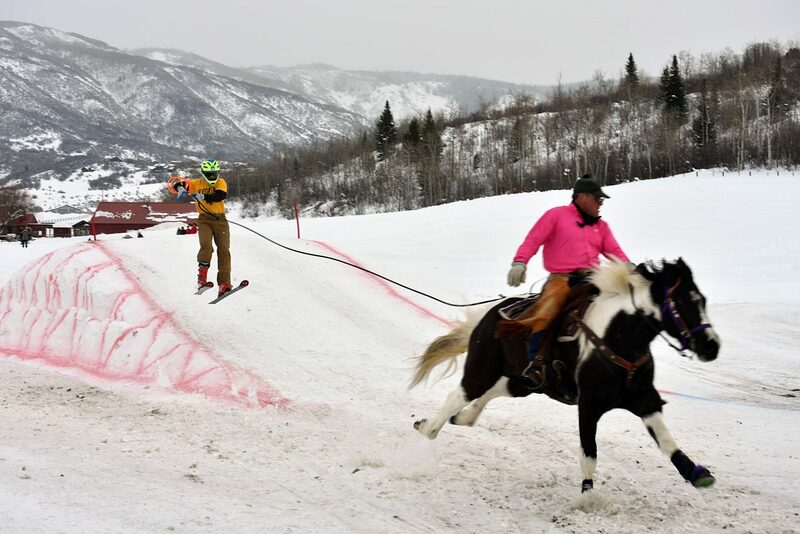 STEAMBOAT SPRINGS — The hooves flew and the skiers did too at Steamboat Skijoring’s inaugural race. Hosted at the Bitter Sweet Ranch on the Elk River, the event drew about 50 competitors in 30 teams made up of equine riders, horses and skiers. Each team was made up of one horseback rider rope towing one skier over jumps and around obstacles. Racers came from all across the states of Colorado and Wyoming to compete. The race differs from the classic Winter Carnival event in a few ways, though Zhimanskova said the skijoring races compliment the Carnival. Teams are around the same age, so adults pull adults and kids pull kids. They race on a straight course made up of jumps, gates and rings. To get the best score, racers had to be the fastest to land each of the three jumps, maneuver around a gate and grab two plastic rings hanging over the course. Miss any of these steps, and a team received a two-second penalty on their final time. Groups are split into divisions based on their time. The race had a prize pot of $3,000 to $4,000, which Zhimanskova hopes to grow next year. The event also raised money for the Veteran Barn Door Project, which conducts equine therapy programs for veterans, and Mountain Valley Horse Rescue, a rescue and rehabilitation facility for horses on the Western Slope. The racers fly down the track — skiers compared it to being pulled behind a car or being shot out of a canon. It’s been proven this season already that anyone can win. First time skijoring racer Natty Hagood took home first place at a race last weekend in Jackson Hole, Wyoming. He turned out again for the race in Steamboat. Steamboat was Marmor’s first skijoring competition. He got into the sport because his girlfriend, who owns a horse, was interested in it. They’ve been practicing at a track near their home in Golden. He was impressed by how welcoming the community of cowboys was. He’s hooked. He plans to compete in Kremmling next weekend. The race was Skijor USA’s inaugural race in Steamboat. The nonprofit formed in March 2018 and has built a network of affiliated skijor events in Colorado, Wyoming, Utah and Montana, culminating in a national championship in West Yellowstone, Montana. Though it was a first-time event, Faust said the competition was fierce. Many of the teams vying for the National Championship Finals were competing. “The level of competition at this race for the southern division is about as tough as it’s going to get,” Faust said. He said many of the horses racing Sunday would be competing in Leadville, one of the largest skijoring contests. Today’s winners included Division 1 champion TJ Simmons of Ordway, Colorado, riding Turbo and pulling skier Jason Decker of Denver, Division 2 champion Joh Hyde of Boulder, Wyoming, riding J.R. and pulling skier Natty Haygood of Jackson, Wyoming, and Division 3 champion Jorge Calzadillas of McCoy, Colorado, riding Antonio and pulling Shaun Gerber of Eagle, Colorado. 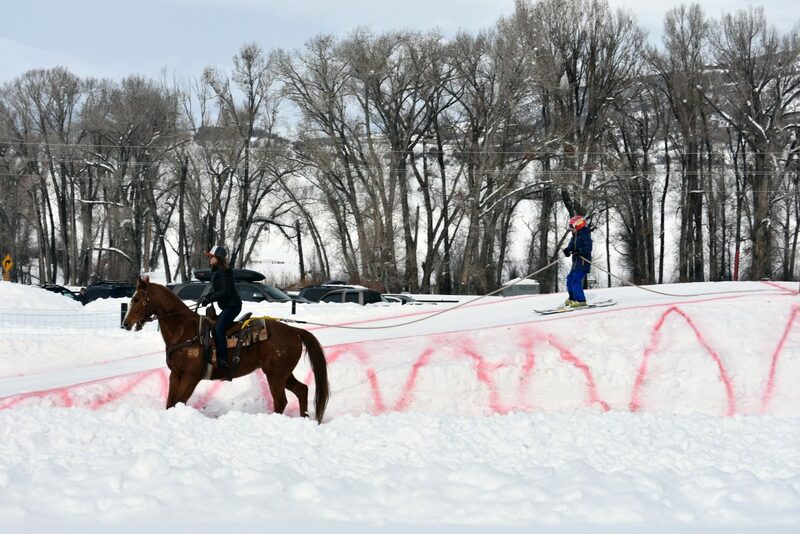 Barri Daino pulls Fritz Gamber in an exhibition run in Steamboat Skijoring’s inaugural event. After the competition, members of the public who didn’t wish to compete could participate in just-for-fun exhibition races. This included children and those who are growing more confident on their ski legs. As much as Zhimanskova loves the serious competitors, she said the reason she does it is for these recreational skijorers. “That’s the way we grow the sport, by getting people like that involved, making it safe for them and making them feel welcome,” she said. Zhimanskova said the event compliments Winter Carnival. The timing of the event between Winter Carnival and Steamboat Resort’s Cowboy Downhill was intentional. She’s working to recruit cowpokes from the Cowboy Downhill, and surprisingly, she said some have expressed interest in riding the event on skies instead of horseback. She said FIS World Cup level skiers and snowboarders are also interested. Zhimanskova is already mulling plans for next year’s event. This year’s event was a good first start, she said. She hopes to host more competitors with a bigger prize pot and prepare for more spectators in 2020. “We’re going to just use what we’ve done right here, and do it better next year,” she said. 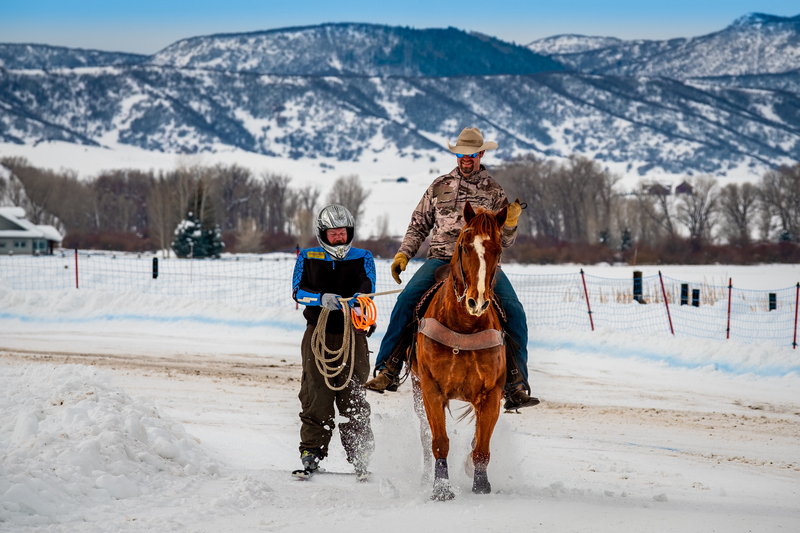 If you’re interested in skijoring, Skijor USA will host clinics with experienced skiers and horseback riders before its Kremmling competition next weekend. For more information, visit http://www.skijorusa.com.